Block Captains help knit our neighborhood areas and our community together. The focus of the Block Captain below duties is to serve the residents by making Bellamy Woods a safe and welcoming neighborhood environment. 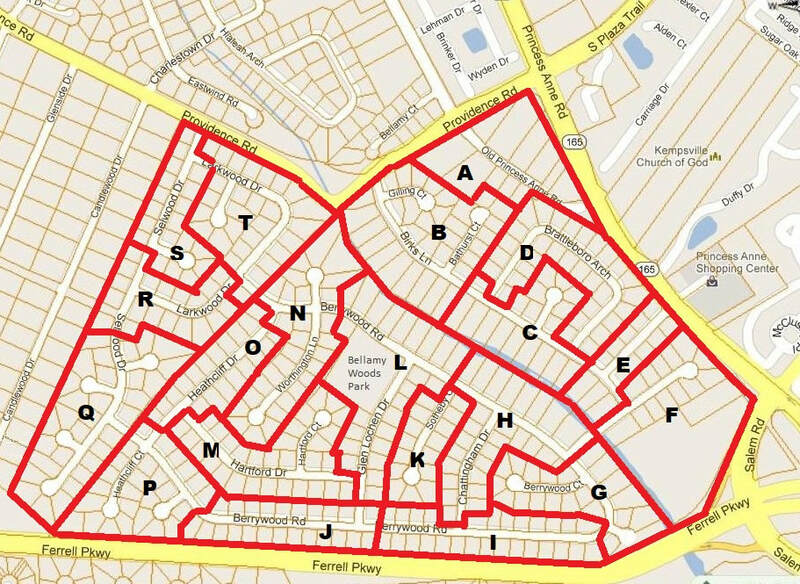 1 - Be the key link for their assigned area as shown above in the Neighborhood Watch effort. This includes passing along any Neighborhood Watch crime alerts and other civic league messages to their neighbors. 2 - Encourage their neighbors to be active Neighborhood Watchers and to go online to view the City of Virginia Beach's Neighborhood Watch presentation. The presentation can be found at <https://www.vbgov.com/government/departments/police/opsdiv/Pages/NeighborhoodWatch.aspx>. 3 - Act as the civic league's official Welcome Greeter for new neighbors joining the community. Encourage new neighbors to join the Bellamy Woods Civic League by providing them with a membership form. Advise the Treasurer if residents move away so we can keep our database up to date. 4 - Report any problems you notice to the City of Virginia Beach (potholes, cave ins, street lights out, flooding, etc.). Encourage neighbors to do the same by downloading the city's "VB Works" mobile application to your smart phone. The "See/Click/Fix" software application approach to identifying problems to the city's attention does work. Please note that Block Captains must be civic league members and are encouraged to attend the league's general membership meetings. If you are interested in becoming a Block Captain or would like more information, please contact us at <bwcl2012@gmail.com>.